1. Washed and soaked rice submerged in water for at least 5 hours, drained the rice. 2. Grind soaked rice, 180 g of sugar, 400 ml coconut milk, salt and tapioca flour together to form a thick batter. 3. Divide the batter into 3 equal parts. Add 200 ml of water to one part of the batter to make white batter. 4. Cut pandan leaves into small pieces, add 200 ml of water into a mixer and grind into a thick paste. Sieve and squeeze out as much pandan juice as possible, add the juice into the second part of the batter to form green batter. 5. Blend 1/2 tsp of Ang Chow with 200 ml of water and add it to the third part of batter to form the red batter. 6. Grease a 7-inch baking tray and place it in steaming pot over high heat for few minutes. 7. Pour in slightly more than 1/2 cup (130 ml) of red color batter, cover with lid and steam for 3 minutes or until the batter is set. 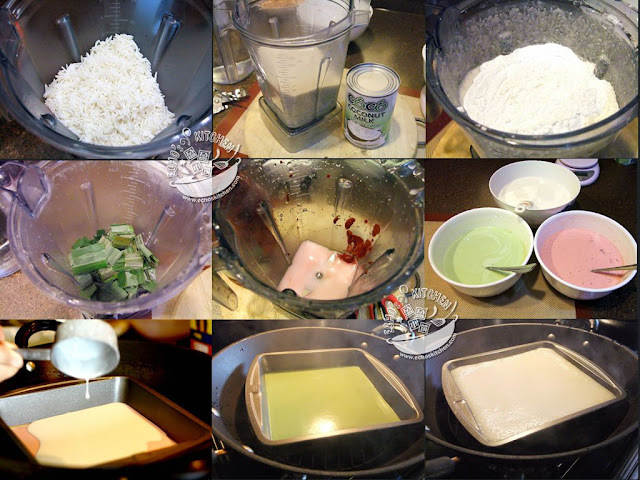 Then add slightly more than 1/2 cup (130 ml) of green mixture onto red layer and steam for another 3 minutes, repeat with white color batter. 8. Repeat the steps alternating colors until all the batters are used. Remember to stir the batter every time before adding for steaming. 9. Steamed the last layer of kuih lapis for 13-15 minutes to ensure the cake is fully cooked. 10. 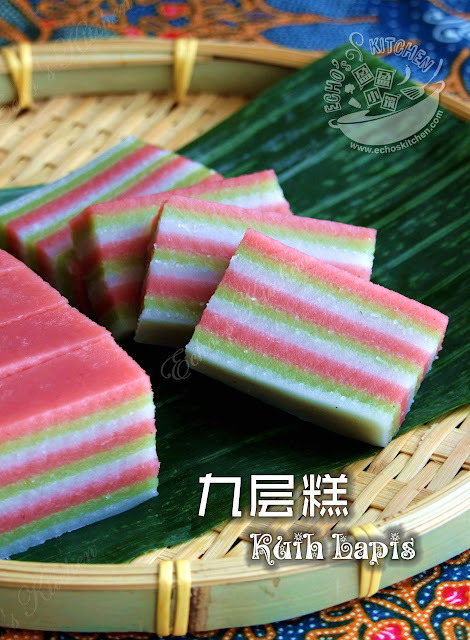 Leave the steamed Kuih Lapis to cool completely (around 2 hours), invert the pan to knock out the kuih. Grease knife before cutting. 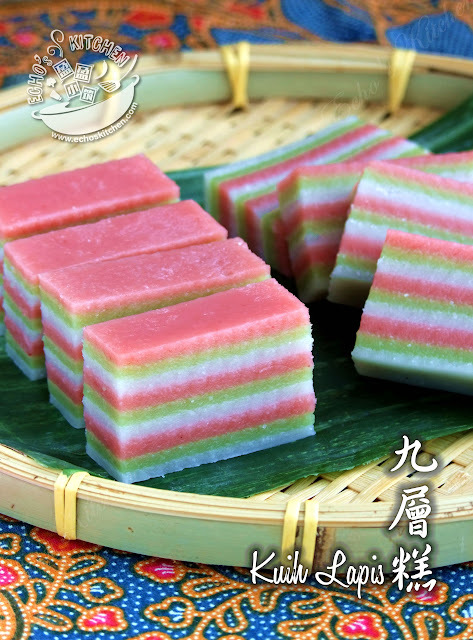 I will add more red colouring in the last layer batter, that means the top layer so that the kuih will look much brighter and outstanding !! On your ingredients list, you listed "corn flour", but the box in the picture shows corn starch...is it the same thing?